VICE-PRESIDENT Inonge Wina has urged politicians to continue showing unity and love for each other for the sake of keeping Zambia united. Ms Wina said politicians in Zambia should continue co-existing despite coming from different political parties to ensure that Zambia remains united. The Vice-President was speaking during the funeral service for the late Patriotic Front (PF) Bangweulu Member of Parliament (MP) Chifita Matafwali at the Cathedral of the Holy Cross in Lusaka. Mr Matafwali, 56, died on May 20, this year in India and was buried yesterday at Memorial Park in Lusaka. “I pray that this (unity and love) should be the spirit to keep Zambia together,” Ms Wina said. 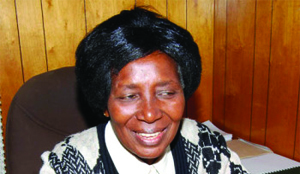 She said Mr Matafwali’s death has left a gap in the party ranks, in Bangweulu Constituency and in his family. Ms Wina said Mr Matafwali will be remembered for his courage and perseverance. She said that his perseverance was seen even when his health was failing because he continued to go to Parliament and contributed immensely especially on economic matters. Mr Matafwali was an advocate of democracy and good governance, whose love for people went beyond party lines. Ms Wina said that she was happy that his love for all was seen by the MPs from different political parties who were the pall bearers. She said the late Mr Matafwali’s family and constituency should be proud of his contribution and remain united. Earlier, his daughter Ngosa said Mr Matafwali was a loving man of integrity and perseverance, and that the family would miss him dearly. The late Mr Matafwali was born on November 28, 1959 in Samfya where he attended both his primary and secondary education after which, he studied economics at the University of Zambia. His father, Scott, was also Bangweulu MP from 1970 to 1978. After university, he worked for Price Waterhouse and for Chibote Investments until 2001. He then became a consultant and contested the Bangweulu Constituency seat in 2001 under the Zambia Republican Party and lost. He contested the same seat in 2011 under PF and won. Mr Matafwali suffered from kidney failure and he travelled to India for a kidney transplant. He died after the operation. He is survived by a wife Anne and six children. Speaker of the National Assembly Patrick Matibini, his deputy Mkhondo Lungu, Parliament staff, ministers, deputy ministers, MPs, chiefs Kalasa Mukosa and Kasoma Bangweulu of Luapula Province, PF and opposition party members of Bangweulu and Lusaka and many others attended the church service.